Meet Madison and Broadway. We have been waiting with baited breath for REV’IT! to offer up some Women’s jeans for a while now, and I’ll tell you why. Through their other gear, REV’IT! has shown that they know how to fit the female body and do so without compromising protection, comfort, or style. 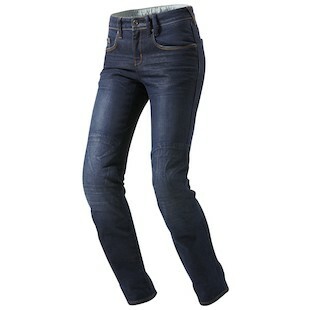 Let’s start with the REV'IT Madison Jeans. The Madisons are a mid-rise, straight fit jean offered in a classic Blue Denim wash, slightly distressed around the knees. In typical REV’IT! style, the Madison jeans are constructed with a COOLMAX technology that enhances breathability and helps regulate moisture by wicking it away. These jeans are perfect for those of us who want to ride in jeans, but need a little extra function. Then, we have the REV'IT Broadway Jeans. The Broadways offer the same fit, but are a darker wash and a slightly beefier pant for the rider who wants all of her bases covered. These pants are equipped with PWR panels at the seat and knees that meet CE Level 1 standards and the option to add SAS-TEC armor in the hips. Boom, need we say more? Wait, there is more. Each pant is also complete with Knox CE protection in the knees that can be adjusted and tailored to your height. And, they’re constructed with Cordura Denim fabric to give you both abrasion resistance and that soft, worn in feel that we all love. Innovative, feminine and classic. Denim done right.